In this above average re-imagining of “The Monkey’s Paw”, Deathdream tells the story of what happens to a family when an American soldier, Andy (Richard Backus), returns home despite having been reported as being KIA in Vietnam. Utilizing the zombie genre crossbred with the vampire mythos allows the filmmakers to explore the post-war traumatic stress syndrome and alienation experienced by returning veterans. Andy returns devoid of emotion, unable to reconnect with his family (John Marley, Lynn Carlin, Anya Ormsby), and it emotionally and literally ends the family unit, especially when it becomes apparent that, in order to sustain his appearance, he must consume blood and he kills a truck driver and the local doctor. 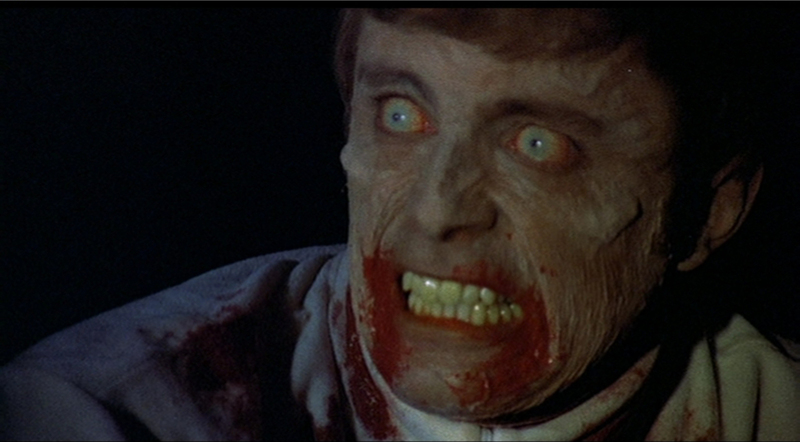 I was very impressed with the aging make-up used on Andy and was very surprised to discover that this was Tom Savini’s earliest make-up effects gig. He assists Alan Ormsby, true, but you can definitely tell that Savini’s hand is there, especially as Andy’s appearance deteriorates. Richard Backus does well, though the direction to keep his emotions out of the performance denies empathy with his character, so that his monstrous actions are not as tragic as they should have been. John Marley (from The Godfather) and Lynn Carlin are excellent as the father and mother, and it is through their reactions that most of the emotional weight of the film is carried. Bob Clark, we now know, went on to direct Black Christmas, Porky’s, and A Christmas Story, so it is interesting to see his earliest effort and how he grew as a director. His work here is quite good and allows the story to come through in spite of the budgetary constraints. Two stand-out scenes include when Andy is visited by some neighborhood kids and freaks out and chokes the family dog to death; and when Andy goes on a double-date with his sister at the drive-in, and his date notices pus leaking from his forehead and he freaks out and goes on a killing spree. ** stars for an interesting take on the veteran homecoming as undead subgenre, though foiled by a lack of a tragic lead.